Desktop Alerts is windows application which delivers Alerts from your service provider straight to your desktop. It has single click installation, is very simple to use and doesn't require any other software to run. Here you can see Desktop Alerts software version, Copyright Notices, Disclaimers and Links to our website. Here you can set various options like Sound Alert in which you can select default or customized sound to play when new alert arrives. Here you can set Alert application to Sleep mode over time interval. No Alerts will be shown during this period. Here you set the time taken for Alert window to close itself automatically. You can also set this option "Off" so that Alert Window doesn't go away until you press the button. This can be useful for important alerts. Here you can set the position of Alert Window which pops up whenever there is new alert. You may choose from any of the 8 positions across the screen namely Top Left, Top Middle, Top Right, Bottom Left, Bottom Middle, Bottom Right, Left Center and Right Center. With this option you can avoid too much clutter around systray area of your desktop. 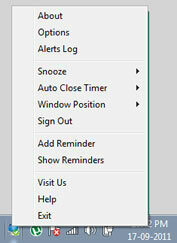 You can Sign Out of Desktop Alerts so that no Alerts are fetched from your account till you Sign In again. This can be useful when you are away from computer for extended periods of time. Here you can open previous Alerts Log window showing all previous alerts as they appeared. This can be useful in case you didn't saw them before. You can clear the Log when required. This opens up website of your service provider. Here you can close the alerts application.